Ghana became a crown colony in 1874, when Great Britain established control over some territories of the state. Britain proclaimed these areas (at that time they belonged to Kingdom of Ashanti) to be British Gold Coast. 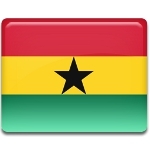 The sate of Ghana was established only in 1957, when its first Prime Minister Kwame Nkrumah declared its autonomy. On April 27, 1960 a constitutional referendum was held in Ghana. People ratified transit of the country from a constitutional monarchy to a republic with a presidential system of government. On the same day people of Ghana elected its first president. There were two candidates: Kwame Nkrumah (representative of the Convention People's Party) and J. B. Danquah (the United Party). Majority voted for Kwame Nkrumah, who, as the first President of Ghana, declared the state a republic on July 1, 1960.